How to watch All the President's Men (1976) on Netflix United Kingdom! Sorry, All the President's Men is not available on British Netflix, but you can unlock it right now in the United Kingdom and start watching! With a few simple steps you can change your Netflix region to a country like USA and start watching American Netflix, which includes All the President's Men. We'll keep checking Netflix United Kingdom for All the President's Men, and this page will be updated with any changes. 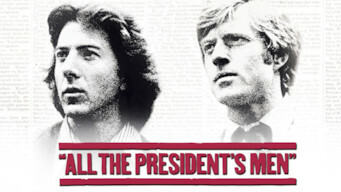 All the President's Men is not available in United Kingdom BUT it can be unlocked and viewed! Newspaper reporters Bob Woodward and Carl Bernstein uncover a shocking story, exposing a trail of corruption that topples the Nixon administration. Something's rotten in the White House. Two men will put themselves on the line to find out what it is. There is a way to watch All the President's Men in the United Kingdom, even though it isn't currently available on Netflix locally. What you need is a system that lets you change your Netflix country. With a few simple steps you can be watching All the President's Men and thousands of other titles! Watch "All the President's Men"